Find your perfect apartment when you rent a one-, two- or three-bedroom apartment from New Longview Apartment Homes in Lee’s Summit, MO. With wood-like floors, in-unit washer and dryers, walk-in closets and quartz countertops, these apartments are tailored to your highest standard. The one-, two- and three-bedroom apartments available in this Lee’s Summit, MO community are built to your standards and tailored to improve your quality of life. 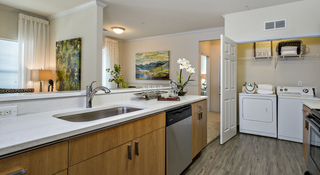 Residents at New Longview Apartment Homes love the little touches we’ve added to each smoke-free apartment, including nine-foot high Trey ceilings, USB outlets in the kitchen and wood-like flooring in the bathrooms and kitchens. You’ll appreciate the scenery no matter which view you select; historical, lake or urban views are available. With so many layouts options, there’s no wrong choice. The apartments at New Longview exceed every measure. At 765 square feet, the one-bedroom, one-bathroom units have an open kitchen that overlooks both the living room and the designated dining room. The kitchen also contains a laundry closet with an in-unit washer and dryer. The master bedroom has two large windows and a walk-in closet. Across the hall from the bedroom, the bathroom has a soaking tub and a vanity. Ranging from 856 to 1,156 square feet, New Longview has seven two-bedroom apartment layouts available. Of those, five have two bathrooms. The kitchens and bathrooms in every unit have convenient wood-like flooring, while the living, dining, and bedrooms have comfortable carpet. Each apartment comes with a washer and dryer located in a laundry closet, too. Additional features include a private patio or balcony and walk-in closets. The available three-bedroom, three-bathroom units range from 1,244 to 1,283 square feet. Each of the three bedrooms includes a walk-in closet. The master bedroom also has private access to an en-suite bathroom. You can opt for a unit with a standing shower or a soaking tub. Additionally, you can choose between a patio and a balcony. All units include a washer and dryer. Schedule a tour with a leasing agent.